Melanie Suzanne Wilson worked with Nathan Keene, the photographer and writer. 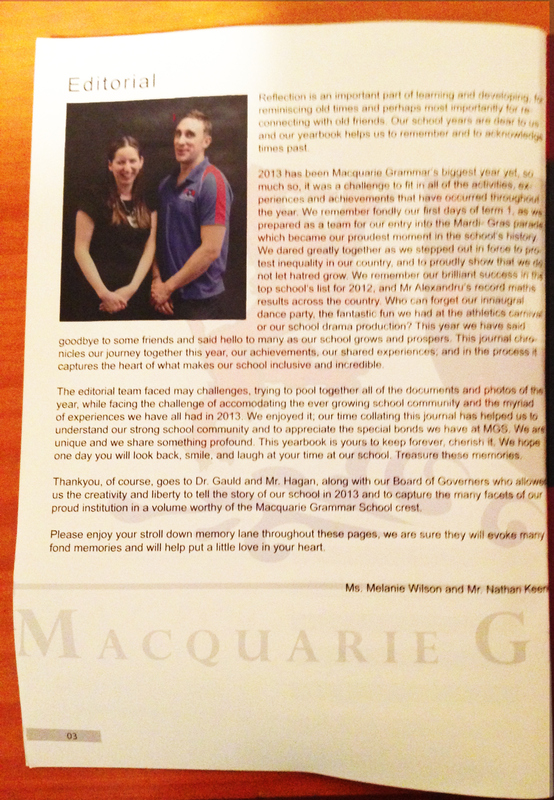 Melanie created graphic designs for a yearbook at the Macquarie Grammar School. This was a professional project as staff at the organisation. Melanie Suzanne Wilson took on the temporary project of designing for print, as staff at the Macquarie Grammar School in Sydney. She used Adobe InDesign, Illustrator, and Photoshop. Illustrator was the best way to adapt an eps logo for print quality. Pantone colours were chosen for the logo and backgrounds. Photoshop brightened images and brought out the already bold colours in photographs. InDesign was used to achieve a perfect layout before the publication was sent to professional printers.